Mnguni on Sunday visited TB Joshua’s Synagogue Church of all Nations in Nigeria to seek deliverance. Pastor Penuel Mnguni of the End Times Disciples Ministries in Soshanguve, Pretoria, visited TB Joshua’s Synagogue Church of all Nations in Nigeria on Sunday and explained why he had fed his congregants live snakes. Mnguni made headlines in 2015 after feeding his congregants live snakes, live rats, underwear and their own hair. He also put one of them in a freezer for more than 30 minutes, trampled and jumped on them, drove a car over them, and placed big speakers on them. He also rode on one of his members as if he was on a horse. His demonstrations landed him in hot water with the SPCA, which ended up opening a case against him. He was arrested, and later released. Speaking to TB Joshua at his church, Mnguni, who described himself as an “overseer” of his church, said he had misinterpreted the Bible and did what he thought was scriptural at the time. It was after watching TB Joshua on TV that realised what he was doing was wrong. He said he went to Nigeria to seek deliverance from the prophet. He said: “My name is pastor Penuel Mnguni from South Africa, a general overseer of End Time Disciples Ministry based in South Africa. I am known as ‘snake pastor’. 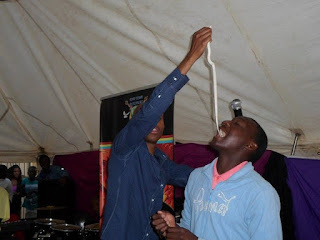 I’m popularly known as the ‘snakes pastor’ due to the demonstration that took place in my ministry when I gave live snakes to my congregants to eat.